Bonnie's PAF (Photo Art Friday) challenge this week was to present an art piece that shows "aging." 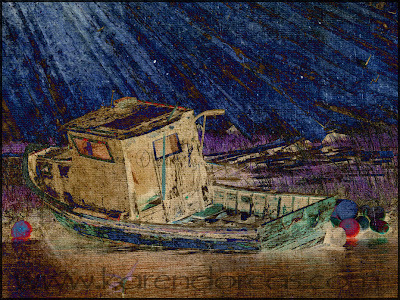 Since I had just posted my "junk boat" a couple of days earlier, I decided to play with CS5 and/or PSE10 to use a couple of Bonnie's textures in the process. Here is what happened. The first is a SOOC shot of the original (for those who didn't see it earlier); the second adds the warming ancient treasure texture; and, the third (perhaps my favorite because a variation would make a great acrylic painting) uses the vintage vellum texture. 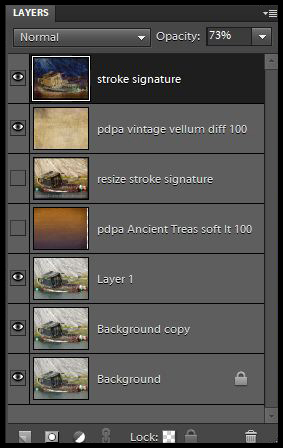 A layers display is shown at the end for those who follow along with that sort of thing - I did it in one PSD file by turning the "eye" on/off. Hope you enjoy. I sure had fun experimenting. As always - click on the photos for a larger view. interpreted the challenge, please click the link below. You have really made that poor, tired boat into a beautiful piece of photo art Karen! I like what you addition of Vintage Vellum texture did to the final product. Thanks so much for sharing your art and your process with PAF. Hi, Karen! I enjoying your wonderful beauty of aging boat pictures. Great photo processing. Consistently in awe of your creative abilities, Karen. Wow! Looks great Karen. I really liked the original. The vintage vellum texture is a nice touch tho. These are fabulous Karen but my favourite is the last one. I love to use 'diffrence' blend mode. very cool - all variations. Wonderful image. I really like the original and the first edit. oh Karen, I love this and your generosity is much appreciated, too. It is all starting to make more sense when I can see that "crumb trail" of what you did. NOT that I understand much of the terminology yet, but like most different languages, I am starting to put a few things together!! love them ALL for different reasons, and it is pretty cool beans that you showed each on its own. I really like the SOOC shot of the ageing boat. The last edit is cool and makes it look like a night scene. I really like version in the middle ! Wonderful! I also vote for the middle version! Hopping from Photo Art Friday. Karen, this is incredible. I love the end result, but I also like the picture "in between" a lot - it's the warm tones that speak to me. Very beautiful processing. Oh my gosh, I love this!!! You will have to teach me!!!! 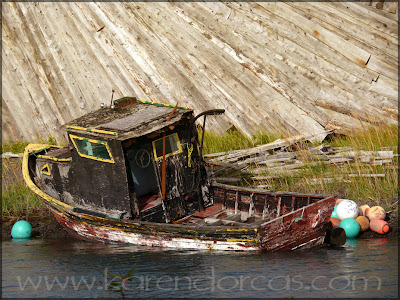 Karen -- I love every version of your junk boat photos!